Nashville, TN - On her new album Bridges – being released on July 8th thru Cleopatra Records - 18-year-old singer and songwriter Mary Sarah duets with some of country music’s biggest names on 12 captivating songs. 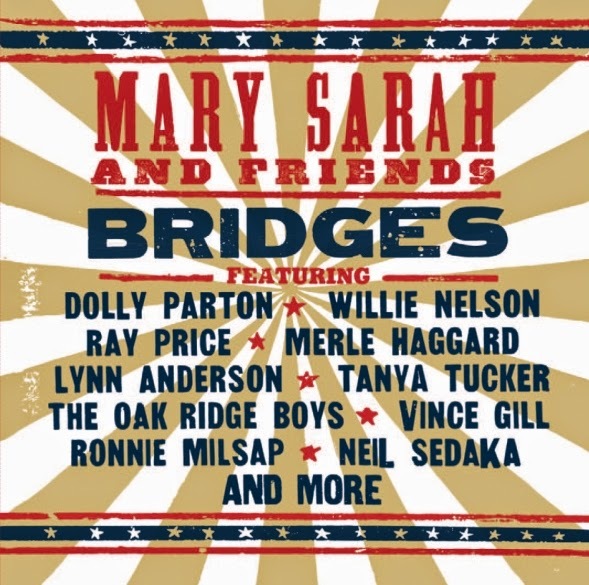 Amazed by the Texas ingénue’s voice and talent, Dolly Parton, Willie Nelson, Merle Haggard, Vince Gill, the Oak Ridge Boys, the late Ray Price and others all signed on to sing with Mary Sarah on their most iconic hits. Dolly’s “Jolene,” Willie’s “Crazy” and Merle’s “The Fightin’ Side of Me” are just a few of the songs interpreted by Mary Sarah and her A-list collaborators. Produced by Kent Wells, Dolly Parton's long-time band leader and producer with oversight by executive producer Freddy Powers, who helped Mary Sarah assemble her dream collaborators, Bridges was moved along by the singer’s keen use of social media. “I've been singing since I was 8 years old, touring and posting my performances on YouTube,” says Mary Sarah, who already has amassed 80k+ followers on Twitter. “One day I got a tweet from the Oak Ridge Boys. They asked me to sing at their concert that night. It was incredible. My love of the legends of country music grew, and that’s how this project was born.” It was thru this newfound relationship with the legendary Oak Ridge Boys that led to Mary’s eventual deal with Cleopatra Records – the American record label who had just released the Oak Ridge Boys new live album 'Boys Night Out' for her own N. American release of the 'Bridges' album.